Located in Carrara, Mercure Gold Coast Resort is in the suburbs, a 1-minute drive from Palm Meadows Golf Course and 8 minutes from Metricon Stadium. This 4-star hotel is 4.8 mi (7.7 km) from Surfers Paradise Beach. Make yourself at home in one of the 292 air-conditioned rooms featuring LCD televisions. Rooms have private balconies or patios. Complimentary wireless Internet access is available to keep you connected. Bathrooms have complimentary toiletries and hair dryers. Pamper yourself with a visit to the spa, which offers massages and facials. You're sure to appreciate the recreational amenities, which include 2 outdoor swimming pools, outdoor tennis courts, and a health club. This hotel also features complimentary wireless Internet access, concierge services, and wedding services. Grab a bite to eat at the The Restaurant, a restaurant where you can take in the pool view and dine alfresco. Or stay in and take advantage of the 24-hour room service. Unwind at the end of the day with a drink at the bar/lounge or the poolside bar. Buffet breakfasts are served on weekdays from 6:30 AM to 10:00 AM and on weekends from 6:30 AM to 11:00 AM for a fee. Featured amenities include a business center, limo/town car service, and express check-in. Planning an event in Carrara? This hotel has facilities measuring 10097 square feet (938 square meters), including a conference center. For a surcharge, guests may use a roundtrip airport shuttle (available 24 hours) and a train station pick-up service. 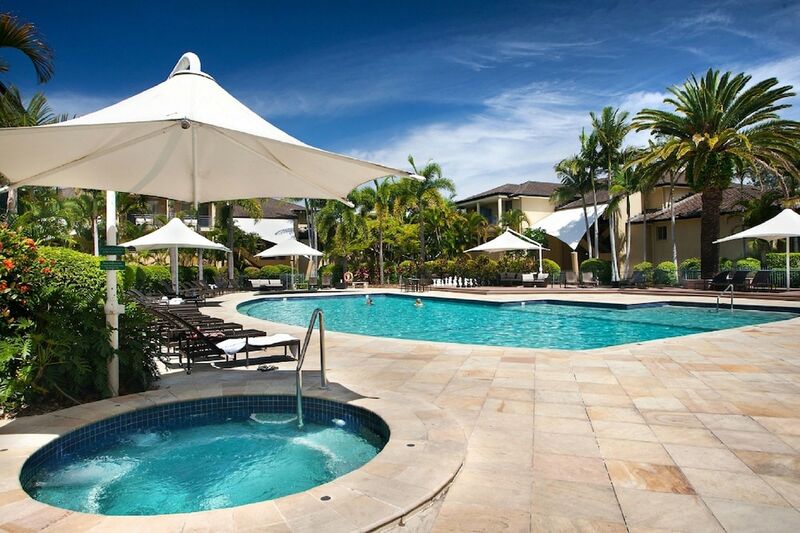 Mercure Gold Coast Resort features a full-service spa, 2 outdoor swimming pools, outdoor tennis courts, and a health club. The hotel offers a restaurant. Guests can unwind with a drink at one of the hotel's bars, which include a poolside bar and a bar/lounge. A computer station is located on site and wireless Internet access is complimentary. This 4-star property offers access to a business center and limo/town car service. Event facilities measuring 10097 square feet (938 square meters) include a conference center. This luxury hotel also offers a children's pool, a spa tub, and a sauna. For a surcharge, the property provides a roundtrip airport shuttle (available 24 hours) and a train station pick-up service. Onsite self parking is complimentary. Mercure Gold Coast Resort has designated areas for smoking. Buffet breakfasts are available for a surcharge on weekdays between 6:30 AM and 10:00 AM and on weekends between 6:30 AM and 11:00 AM. The Restaurant - Overlooking the golf course and pool, this restaurant serves breakfast, lunch, dinner, and light fare. Guests can enjoy alfresco dining (weather permitting). A children's menu is available. Open daily. Outdoor tennis courts and a health club are featured at the hotel. 2 outdoor swimming pools are on site along with a children's pool. Other recreational amenities include a spa tub and a sauna. Future Therapy has 3 treatment rooms. Services include Swedish massages, facials, body wraps, and body scrubs. A variety of treatment therapies are provided, including aromatherapy and reflexology. The spa is equipped with a steam room. This property offers transfers from the airport and train station (surcharges may apply). Guests must contact the property with arrival details before travel, using the contact information on the booking confirmation. Reservations are required for golf tee times, massage services, and spa treatments. Reservations can be made by contacting the hotel prior to arrival, using the contact information on the booking confirmation. The property has connecting/adjoining rooms, which are subject to availability and can be requested by contacting the property using the number on the booking confirmation.